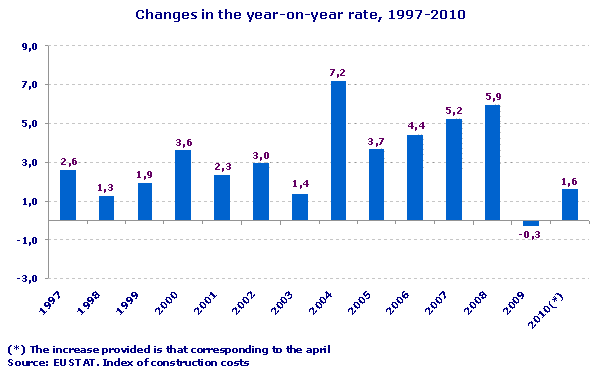 The Construction Costs Index rose by 0.1% in the Basque Country in April 2010 with respect to the previous month, which meant that the year-on-year rate for that month increased by 1.6%, according to EUSTAT data. In April 2010, labour costs remained unchanged (0.0%), whereas the costs of raw material rose by 0.1%. In April, the costs of raw materials in the Building and Civil Works performed differently, with a 0.1% decrease in Building costs compared to the previous month, while they increased by 0.8% in the case of Civil Works. There were differences in the performances of both sub-sectors during the year: building raw material costs rose by 0.6%, whereas those for Civil Works accumulated a 5.8% increase. Oil By-products (39.8%) stood out among the prices of raw materials consumed by the sector that had experienced the highest inflation rates over the last twelve months. Other sectors that registered price increases were Metallurgy (4.2%), Non-Metallic Industry (1.6%), Electrical Equipment (1.5%), Rubber & Plastic (1.4%) and the Chemical Industry (1.0%), among others. On the other hand, the annual prices (April 2010 compared to April 2009) of raw materials decreased in the following sectors: Electricity and Gas (-6.0%), the Timber Industry (-2.4%), Metal Articles (-1.5%) and Electronic equipment (-1.5%), among others.